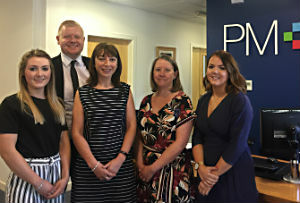 PM+M, the Blackburn headquartered chartered accountancy, business advisory and wealth management group, has made five promotions across the business. Claire Astley has been promoted to tax director. Claire has worked at PM+M for 21 years. She is a qualified Chartered Tax Adviser and Chartered Accountant and specialises in corporate tax, advising a variety of businesses, helping them to minimise their corporate tax liabilities and identify new tax planning opportunities. Claire’s commitment to her client base and her assistance in helping to develop the tax team has earned her this promotion. The additional four promotions have been made in PM+M’s Run My Business team which offers an all-inclusive service to SMEs including cloud accounting, year-end accounts preparation, payroll, VAT and tax returns. Denise Mortimer, who has worked at PM+M for nearly three years, becomes a manager. Denise joined the Blackburn office in November 2016 and moved over to the Bury office as it opened in August 2016. She has played a key role in the operational development of the service for the office and her promotion to manager is testament to this. The additional promotions go to Blackburn-based Lorna Hargreaves and Mark Sharples who become seniors within the team, and Evie Halliwell from the Burnley office who is now a semi senior.